Friday was a lazy day and I laid low trying to get better. I’m convinced it’s just a cold but I still feel pretty crappy. I left my parents’ house at 4:40 (probably the latest I’ve ever left for a home game). I hit some traffic but was parked in the Money Lot just before 6:00 PM. I stopped at a few tailgates on my way inside to tell people about Be The Match and my mission. I met Dani, a twitter follower, outside of the home plate entrance and we headed inside. Dani took game photo number 118 for me in section 109. Only 21 home games left! We went upstairs and we both utilized our designated driver vouchers while I went with a Polish and Dani a Bratwurst. I will admit that the pace of the sausage tally is starting to slow. I might make it to 100 sausages, I might not. I never really had a goal in mind, I just thought it would be fun to keep track of. 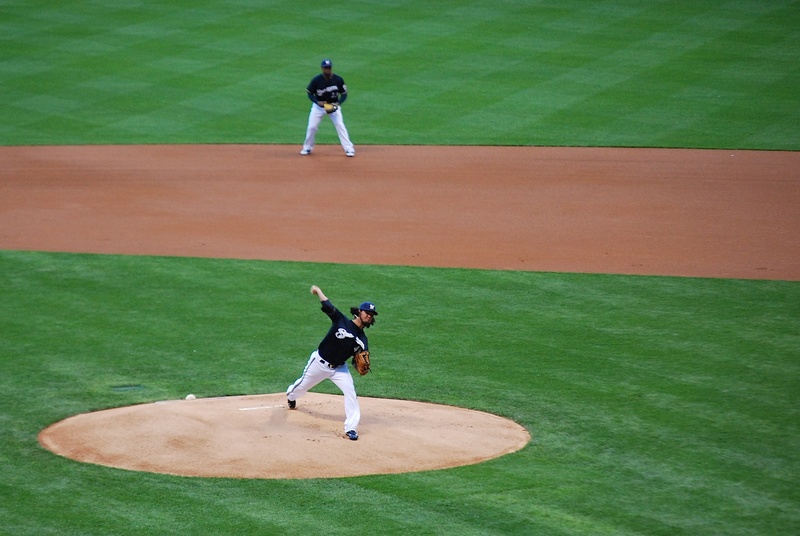 The game started shortly after we got to our seats and Yovani started things off with strike one to Jimmy Rollins. The Phillies elected to intentionally walk Jean Segura to get to Gallardo. I missed the 2-0 pitch of the intentional walk because I was talking to the woman behind us. This has happened four or five times now, and you’d think I would learn. Segura stole second with Gallardo at the plate and Yovani took advantage, singling to right and driving in both men on base. 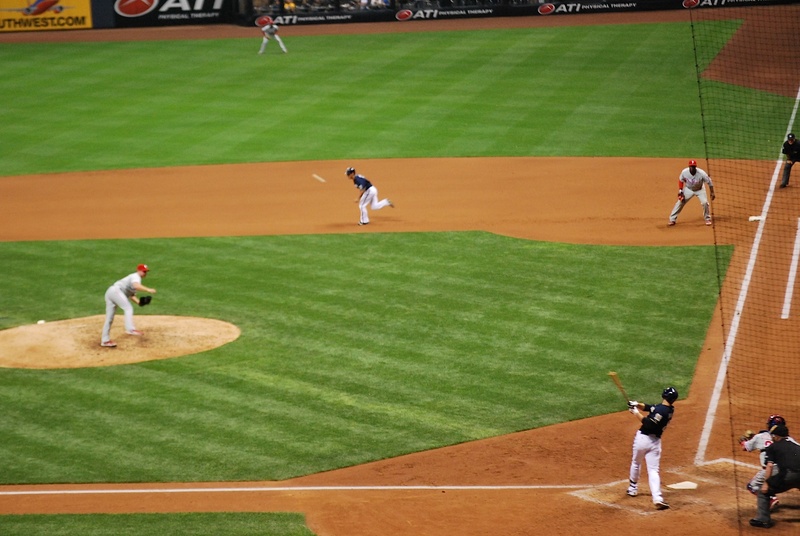 Segura must’ve wanted to practice his sliding because Nyjer Morgan is clearly giving him the stand up sign. At halftime (between the top and bottom of the 5th) I had the lady behind us take a picture of me and Dani. Dani went to school at UW-Oshkosh and played on the softball team. Small world: Dani was a catcher on the team while Annie, who hosted me in Houston, was a pitcher during her year at Oshkosh. Dani donated $40 to Be The Match for her seat, and I’m very grateful. Over $1,000 of the funds raised has come from people joining me at games and donating to the cause. Thanks Dani! And thanks to everyone who has joined the registry or made a donation, everything helps! In the bottom of the 6th inning Aoki walked with one out. 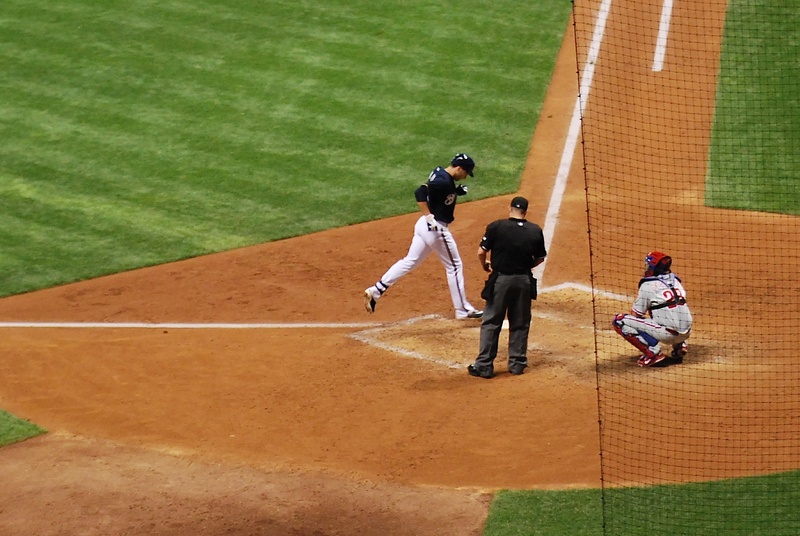 The very next pitch (which was to Braun) wound up over the centerfield fence, increasing the Brewers lead to 6-1. I’ll take (partial) credit for Braun’s home run. Before his first at bat I mentioned to Dani that he had four home runs in four games against the Phillies this year, so he was due. 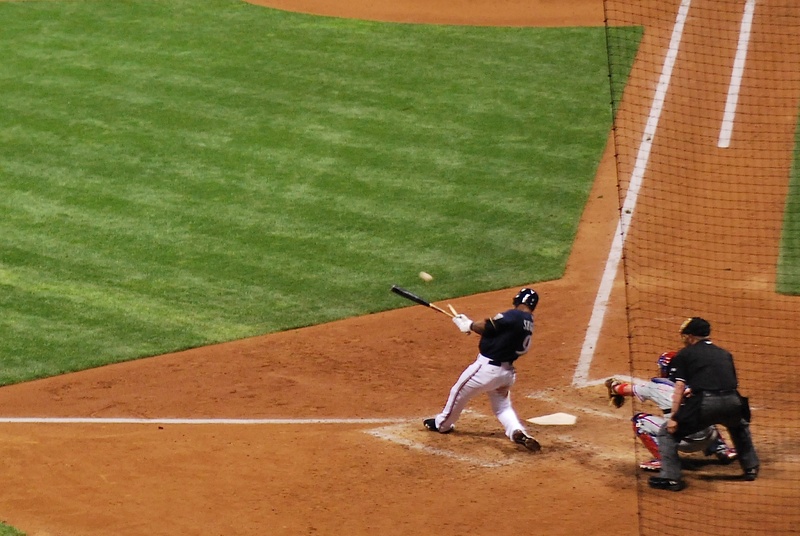 This isn’t newsworthy, but I’ll include the picture I got of Segura breaking his bat in the bottom of the 7th inning. 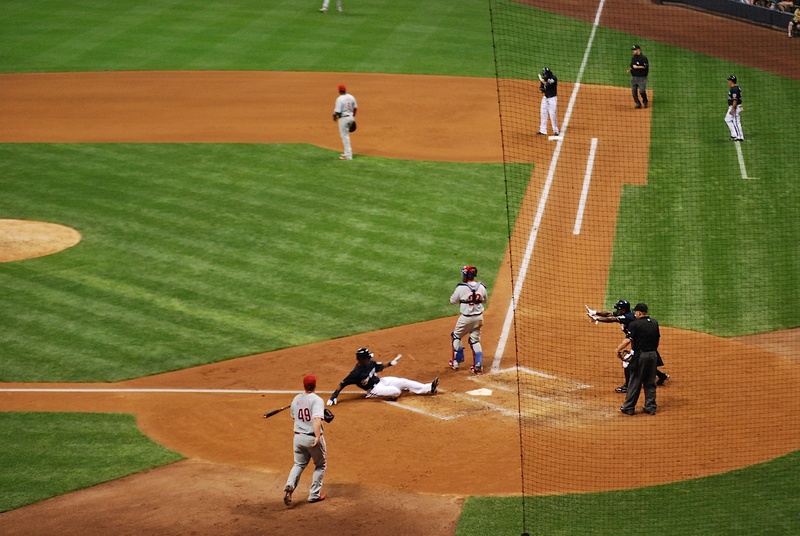 It resulted in a groundout to the second basemen, but I thought it was cool. Livan Hernandez pitched the 9th and he made things a little interesting. 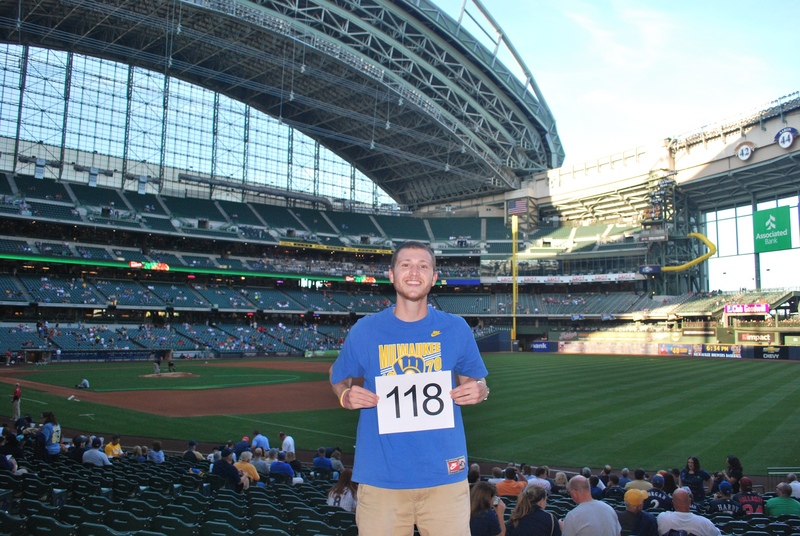 Since I witnessed all three terrible losses to the Phillies in person back in July, I was a little nervous that the Brewers were sitting on six runs. They lost each game in that series by a final score of 7-6. And then I had 320 miles of Interstate 76 and I-76 signs to remind me of the sweep. With two outs the Phillies doubled and singled to cut the deficit to four runs. Hernandez got Brian Schneider to fly out to Gomez, and the Brewers hung on. 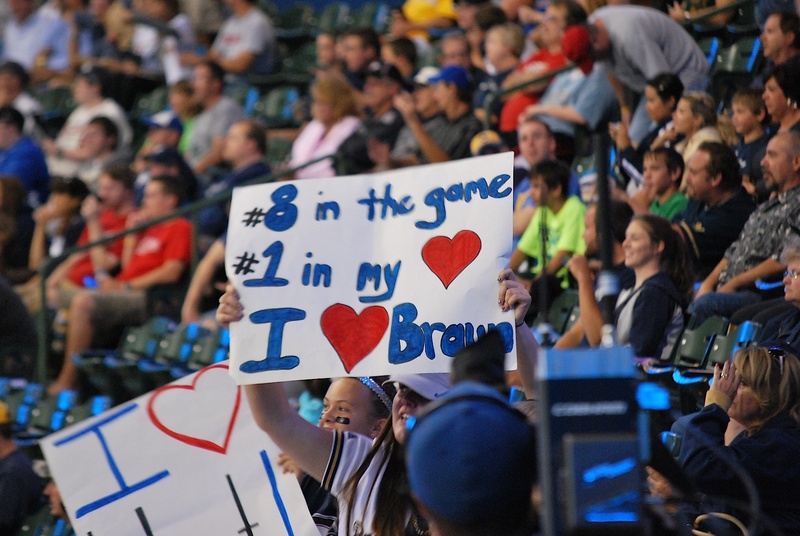 Final Score: Brewers 6 – Phillies 2. 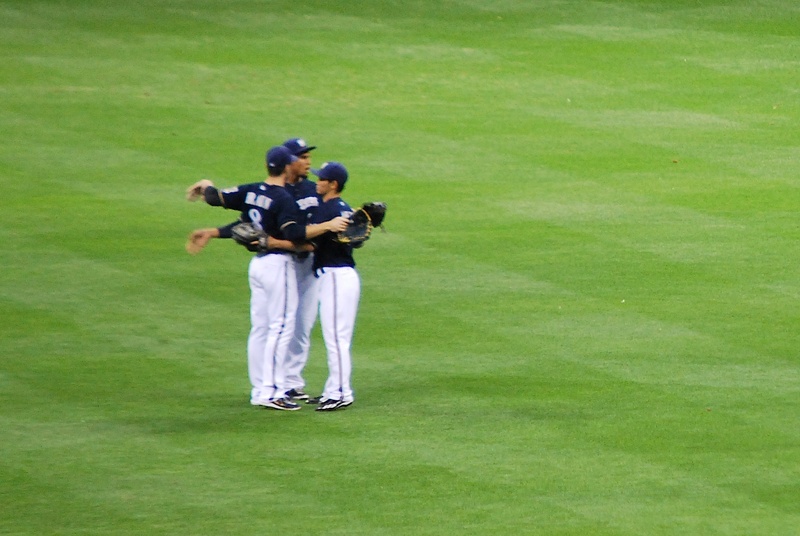 It was group hug time for Braun, Gomez and Aoki after the win. 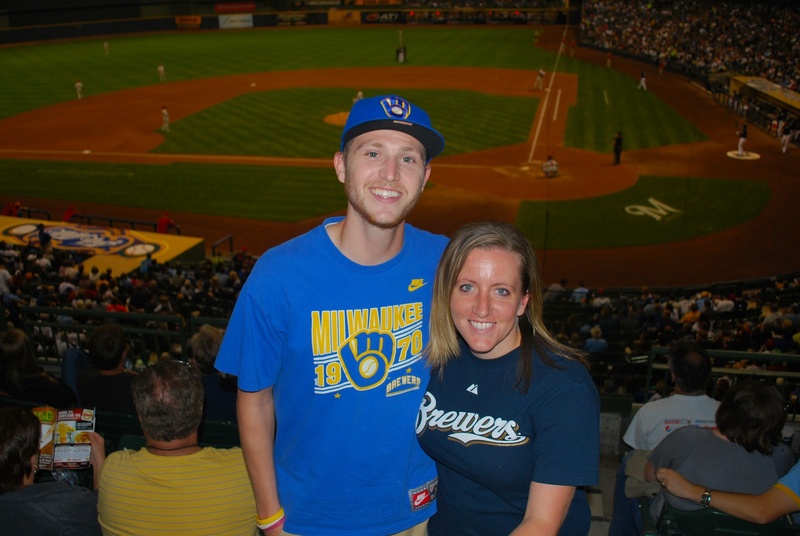 Since the Brewers had been up by five runs, a lot of people left early, something that bugs the heck out of me. Not only are you not getting your money’s worth, you might also miss something historic. Selfishly I also don’t like it because it makes getting out of the parking lot in a timely matter almost impossible. I could tell that when I got to my car it was going to be a while. I waited in line for 7 minutes, moved one car length in that time, and then called it quits. I pulled into a spot, turned off my car, and waited until most people had left. It probably would’ve taken me 30 minutes to get out of the lot anyways, so I might as well not waste my gasoline. I listened to the Around the Horn and Pardon the Interruption podcasts while I waited, so it wasn’t too frustrating. I met Victoria in Sussex at her aunt and uncle’s house, and she’s joining me for Saturday and Sunday’s games.